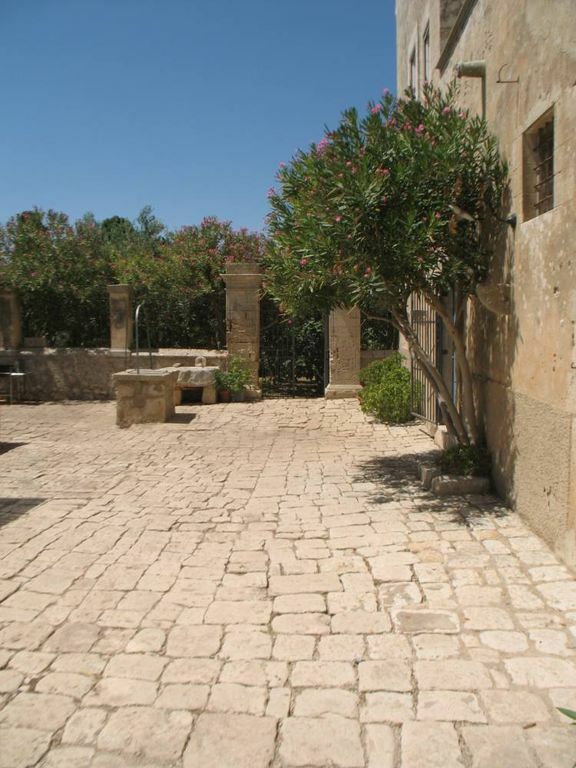 Located in the beautiful countryside iblea a few miles from the beaches of Marina di Ragusa. Placed on top of a hill between fields of carob trees, the villa offers a breathtaking view of the surrounding rural landscape giving visitors unforgettable sunsets over the sea. The beaches of fine golden sands of Marina di Ragusa and Punta Secca are within a short drive. The proximity to the Castle of Donnafugata offers the opportunity to participate in numerous cultural events that take place in Summer. We can’t speak more highly of our pleasure when discovering “Bocampello” near Donnafugata Castle. We stayed for a week in September in this historic rural villa set on top of a hill, with a walled garden and stunning views to the distant sea and surrounding fields. The spacious house is full of light as there are windows on all sides, which allows for a welcoming air flow on hot days. The home is well appointed and could accommodate many more than two people. It has been beautifully renovated in a style that evokes a bygone era. Emanuele made us very welcome and is a genuine and generous host. All that we needed was there on our arrival - and more. You do need a car to reach the house, but once settled-in, most things are within 30 minutes to an hour’s drive away: shops, beaches, historic towns etc. The only thing we regretted was not having booked it for longer. We look forward to returning one day soon and will recommend it to family and friends at home. It was great! The landlord met us at a junction and lead us to,our holiday home. So beautiful, old fashioned. We loved it. A lot,of space, modern bathrooms, a great kitchen with supplies, lots of clean towels - anything you can wish for. But the greatest was the panorama. You have different balconies to choose from and just sit and contemplate the Sicilian landscape. Highly recommendable for a reasonable price indeed. Een zeer ruim, stijlvol en compleet ingericht huis, met aan alle kanten een mooi uitzicht. Veel interessante steden en strand in de buurt. Ga zeker naar het vlakbij gelegen Donnafugata, waar je bovendien ''s avonds leuk kunt eten. Zeer attente gastheer, absoluut aan te raden voor liefhebbers van sfeer en rust. Wir haben knapp 2 Wochen in diesem schönen Haus verbracht! Der Vermieter ist wahnsinning nett und hilfsbereit. Wir wurden sehr nett empfangen. Das Haus liegt mitten auf dem Land. Wer Ruhe in wunderschöner Umgebung sucht, ist hier gut aufgehoben. Das Anwesen ist sehr schön. Das Haus sehr geschmackvoll eingerichtet. Wir haben uns sehr wohl gefühlt. MIt dem Auto ist man in 20-30min am Meer oder in netten kleinen Städten in der Nähe. Unbedingt nach Scicli fahren. Eine wunderschöne kleine Stadt. Wir haben knapp 2 Wochen in dieser sehr schönen Unterkunft verbracht. Der Vermieter ist sehr nett und hilfsbereit. Wir wurden sehr nett empfangen. Das Haus liegt mitten auf dem Lande. Wer ein wenig Ruhe in schöner Umgebung sucht, ist hier genau richtig. Von allen Seiten den Hauses hat man einen tollen Blick. Aufs Meer und übers Land. Mit dem Auto ist man in 20-30min an Stränden und in schönen Städten in der Umgebung. Unbedingt Scicli besuchen. Ein sehr hübscher Ort mit toller Atmosphäre. Wir können die Unterkunft sehr empfehlen und haben uns rundum wohl gefühlt. Nochmal DANKE!! E sempre un piacere avere degli ospiti che apprezzano la nostra casa e il paesaggio circostante, tipicamente siciliano. Spero di non aver deluso le aspettative e di averli nuovamente come ospiti. The host was always available and very helpful. He ensured we had everything we needed and gave us some information on the local area and good places to eat. We also had the opportunity to enjoy the swimming pool of the nearby farmhouse against a small fee. We warmly recommend this place. Take the SP direction Comiso, Comiso cross and head towards Santa Croce Camerina SP20, the first roundabout take the 3rd exit and follow the road for 5 miles and take the road of relevance of private accommodation on the right. Exit at LENTINI / CARLENTINI / DUBROVNIK onto the SS514 and follow it until you get to Ragusa, exit DUBROVNIK WEST / COMISO / WIN. At 150 m, take right away on SP14 direction KASTALIA. Continue for 9 km and take the road of relevance of private accommodation Bocampello the left. Follow signs for the SP14 direction KASTALIA. The sea - The Holiday Bocampello is a few minutes drive from Marina di Ragusa, until a few years ago quaint fishing village, today seaside resort full of sandy beaches, typical restaurants and trendy bars. In 2009 and 2010 Marina di Ragusa has been awarded the Blue Flag for beaches, awarded by the FEE (Foundation for Environmental Education) for quality 'of water quality' of the coast services and security measures, environmental education. Wilderness - A short distance from Marina di Ragusa are two nature reserves (scrub forest river Irminio, Forest Reserve Club) with magnificent and wide sandy beaches. Archaeological sites and cemeteries - Nearby Marina di Ragusa there are the two important archeological sites of Caucana and Kamarina (with a museum) and are easy to reach other renowned former colonies of Magna Grecia, such as Taormina, Palazzolo Acreide and Syracuse in beautiful Greek amphitheatres take place during the summer, picturesque representations of classical works. Lovers of nature trails can visit the necropolis of Pantalica and Cava d'Ispica, settlements carved into the rock with archaeological and anthropological extremely important. The Val di Noto - The Holiday Bocampello located in an area rich in culture and history that UNESCO has included for the magnificent baroque and landscape in the World Heritage Site. Within easy reach are the beautiful Baroque cities of Scicli, Modica, Ragusa and Noto.